Here is the cover of our forthcoming publication Narcos Inc: The Rise and Fall of the Cali Cartel. The inspiration behind this cover comes from the infamous scorpion symbol found on drug packages that the Cali cartel trafficked. 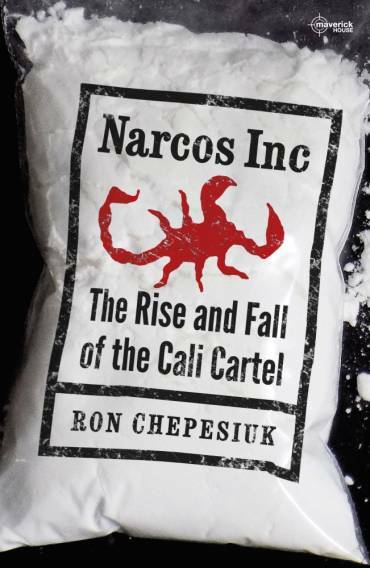 Narcos Inc. is the definitive story of the Cali cartel’s rise and fall, with Ron Chepesiuk providing a compelling insight into the history of international drug trafficking. He draws vivid pictures of the gang’s founders—Jose “the Chess Player” Londono and brothers Miguel and Gilberto Rodriguez Orejuela—and reveals how they built their empire, carving up the massive US market with their rival Medellin Cartel: New York going to Cali, Miami to Medellin. Through organized violence, terrorism, intimidation and bribery, the cartel became a major threat to Colombia’s fragile stability. It also brought an unprecedented degree of strategy and planning to the drugs trade. It would take more than two decades and a global effort to bring it down. Unlike Medellin, led by Pablo Escobar, the men from Cali kept their complex operation in the shadows. It grew quickly and came to operate like a multinational corporation. In time, they became too big to share their spoils and fought an indescribably bloody war with the Medellin mob, a war they ultimately won. If you were glued to your screen while watching the Netflix series Narcos, particularly season 3 which was based on the Cali Cartel then you will love this in-depth peak into the world of the infamous Cali drug cartel. Ron Chepesiuk works as a full-time freelance journalist and film producer in the United States. All in all, Ron has published 25 books and more than 4,000 articles on subjects such as the environment, technology, business, politics, international relations, travel, true crime and transnational crime. Besides his work as a writer and producer, Chepesiuk currently teaches online courses in the journalism program of UCLA’s Extension Division. Narcos Inc. will be available later this year.